Get Fancy with Your Fireplace | Havenly's Blog! The basics of styling a fireplace are pretty simple—Add a mirror atop the mantel, place candles on either side and finish with a bundle of logs on the hearth. Why not try something a little different? 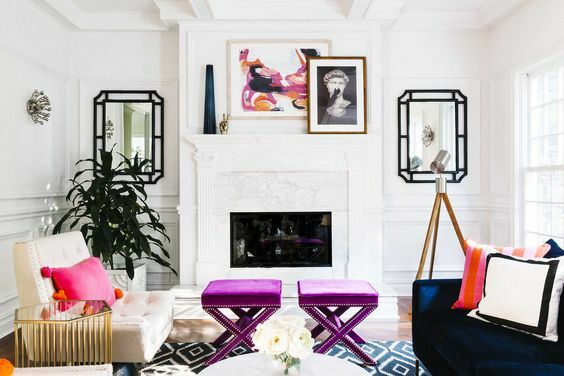 Learn how to style a fireplace creatively with these unique and fun ideas! The traditional way of style a mantel goes as follows: large central mirror or piece of art with candles, vases, or plants on either side of large central item. Shake things up a bit and add in some layered art to the main focal point to create visual interest. What better way to add another aspect of coziness than with candles? If your fireplace is functional, style your mantel with a large grouping of real or flameless candles in different heights and widths. Is your fireplace just for show? A large grouping of tall candles in the fireplace may not keep you as physically warm as a fire, but they sure do give off the comfy feels. Stack your mountains of home decor and fashion mags (it’s OK, we all have them) in your non-functional fireplace, or save this for the warmer months in your functional fireplace when fires are not needed! Using this spot as extra storage works out for those in small living spaces. Opt out of a large mirror or art piece that steals the show and go horizontal! Make sure the average height of your layered frames is substantial enough that they don’t look dwarfed across the room. Tried and true, this stacked look is the most stylish thing you can do to fill that void! Pick up local firewood or dole out some big bucks for the fancy birch logs. Delicate airy greenery like eucalyptus in a clear glass vase has a classic, clean look. To go bolder, try some larger deeper greens by the hearth!